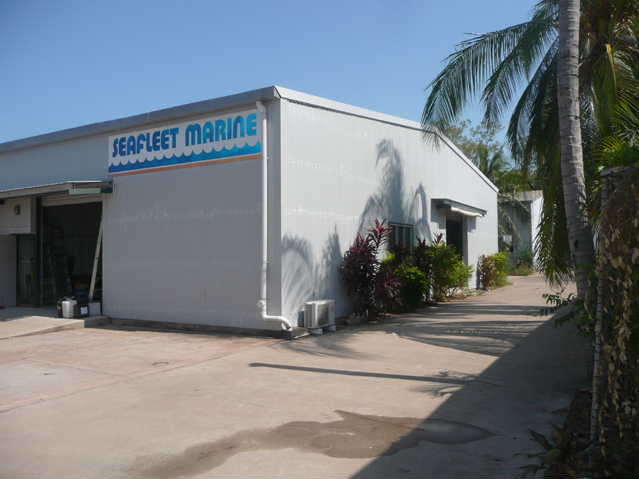 Seafleet Marine has two divisions- Marine and Shade. Marine division specializes in the design and manufacture of racing and cruising Sails, Marine Trimming, Rigging,Hardware and Electronics. While the Shade division is focused on delivering custom made Membrane and Shade Sail Structures for residential and commercial customers. Specialist services include sail design by CAD program, , High Frequency welding, roll swaging of stainless steel rigging, C-Map programming, Certification of shade structure to NT Building Code. Today the business occupies purpose built loft and is equipped with a range of machines that cater for all jobs large or small, lightweight to heavy duty. Seafleet Marine was established in the early 1960’s by Neil Fowler. He designed and built the Arafura Cadet and Arrow catamarans which were launched in 1963. Both lightweight catamarans, in their time, were specifically designed for easy construction by the owner builder and are still competitively sailed in class state and national titles today. Seafleet survived Cyclone Tracy in 1974 and in 1977 the cats were modernised by changing to aluminium beams and trampoline deck. The 70’s saw the chandlery based around the production of the off the beach boats and the small keel boats who made up the local fleet. It wasn’t long before the size of the fleet grew with the Darwin to Dili, Round the islands and the Darwin to Ambon yacht races at around this time. The company saw new ownership in 1995 by the current owner, Scott, with the introduction of Sailmaking services, Rigging and Spars, Canvaswork, Marine Trimming, Residential and Commercial Shade Structures. The chandlery was expanded to Marine Electronics and Deck Hardware to cater for local and visiting cruising yachts. In 2009 the business relocated to its current location in Tannadice St, Winnellie, and continues to provide a personalised service to customers with satisfaction guaranteed. Scott qualified as a Metallurgist before going cruising for 12 months around PNG and Nth Qld waters. Upon return to Darwin he started working in the marine and textile manufacture industry, as an employee at The Yacht Shop, and has been in the industry continuously since 1988, running his own business since 1995. He has had several yachts over the years and currently owns a Pescott Whitehaven Catamaran which he partly built and is still fitting out. A keen sailor, when time permits, and competes in harbour and offshore racing, including Melbourne to Hobart, Sydney to Hobart, Sydney to Noumea and offshore racing into Asia. Over a 30 year career Scott has always been hands on so you can be assured of superior quality. He works in many different disciplines and can provide that level of expertise and experience for your next unique project.